Grouper is a P2P file sharing tool that allows private groups of people to easily distribute files among themselves with no limitation in file types and size, and with integrated IM (instant messaging) and security encryption. Grouper fills a gap left by the first wave of P2P file sharing tools, which provide open and unprotected anonymous file sharing online. Grouper focuses on providing a fun and easy-to-use solution to those who have no need to share files publicly, but do want to share and text chat live with team or family members. Though this is not the first P2P tool to start offering private P2P networking, it's among the few ones that does not add spyware, adware or even pop-ups or integrated banner ads to the user experience. 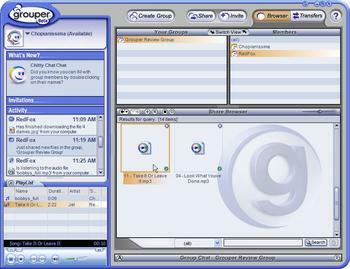 Grouper is the brain child of Grouper Networks, Inc, founded by Josh Felser, Dave Samuel, Aviv Eyal and Mike Sitrin, most of whom are ex-AOL executives. Josh and Dave previously founded Spinning.com, a multi-channel Internet music service. While still in beta, Grouper is only available for Windows PCs. Linux and MacOS versions may be coming next. Grouper is completely free. In the future Grouper Networks Inc plans to develop premium paid versions targeted at small and medium size businesses, offering workspace features like remote access and file transfer to smaller corporate workgroups of ca. 30 members. It is expected that the current package will remain free even after the beta period is over. Grouper is purposely different from other popular file-sharing tools like Kazaa, because it offers multimedia streaming instead of uploading and downloading of music files, hence meaning to circumvent legal issues resulting from sharing copyrighted files. Once installed, Grouper resides in the Windows system tray and can be quickly launched to start sharing personal files. Grouper initially supports only the Windows OS (XP and 2000) and it also requires Microsoft .NET 1.1 Runtime and Windows Media Player (versions 8 or 9 are recommended, Media Player 10 not fully supported yet). The Grouper installer file automatically installs each of these if necessary. Privacy is protected by full AES encryption of all IM messages exchanged and of all file documents shared with your group. More questions are answered in the FAQ. Not just interesting or promising: this is impressive. Worth checking out.